Imagineer Eric Jacobson explained, “A commissary is really just a studio cafeteria, a place on the lot where everybody involved in making movies has their meals, but it has become glamorized in the public mind because of that association and the possibility of meeting movie stars. “We wanted to give guests a commissary that would fulfill those expectations. We wanted to play on the enduring myth of the glamour and excitement of a Hollywood movie studio. The ABC Studio Commissary opened under budget December 1990, roughly a year and a half after the theme park itself, after an aggressive design phase of two and half months. The concept was to use classic, sleek Art Deco stylings popular in the 1930s to create a timeless sense of classic Hollywood where guests might reasonably expect that a movie star could nonchalantly stroll in during a break in filming. The building was located on a newly created street dubbed Commissary Lane. The building is decorated with film posters from the past and present, props and autographed photos and television monitors that promote the latest ABC television shows since the 1996 merger with that company. On its opening, both Michael Eisner and Frank Wells proclaimed it “the best we’ve ever seen” although it probably never matched Paramount’s Café Continental or MGM’s Lion Den commissaries in their heyday. 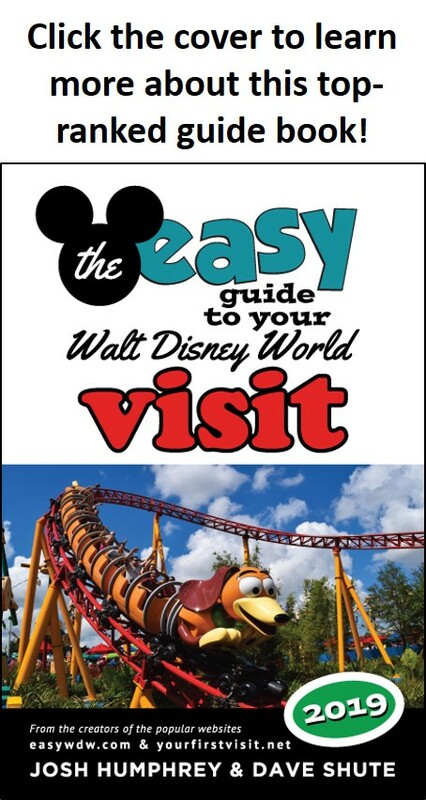 (c) easyWDW. Used without permission but it’s ok. The marquee was designed by Jim Bockstall, juts thirty-five feet into the air, and is polished stainless steel to echo the Art Deco condensed-type style. Once past the faux palm-tree lined atrium entrance, there is always plenty of seating and air conditioning. The palms are ten feet tall and are meant to frame the ordering counter. 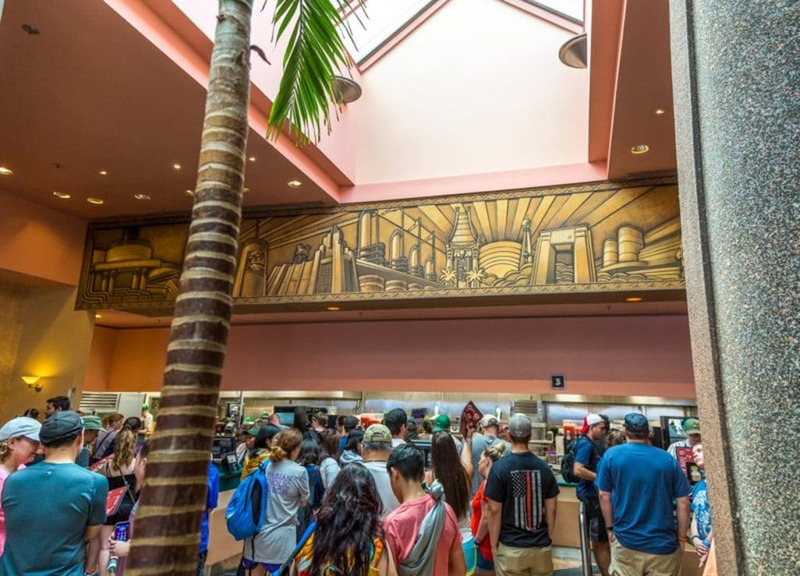 There is a fifty foot long mural that features many of the major landmarks of the original Disney MGM Studios designed by Han Woo Lee. It was painted by Bill Anderson to look like copper bas-relief, a popular Deco design motif. For the interior, landscape designer Joe Parinella brought in palms and added planters with a variety of seasonal plants to establish a “garden-like” atmosphere that would seem more inviting than the stark, functional interiors of some traditional studio commissaries. Thanks, Jim! Menus are here. 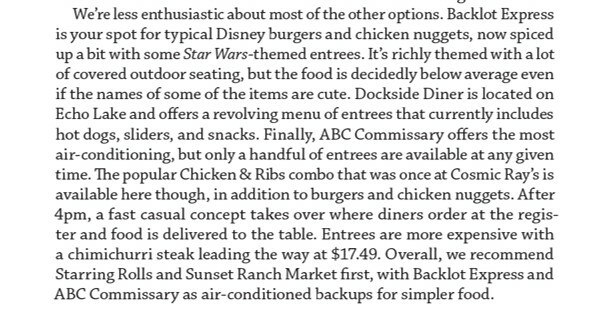 My co-author Josh has reviews of lunch at ABC Commissary (at the end of the post) and dinner at ABC Commissary (keep going through the “it used to be terrible” section). I don’t recall if this was done in the past, but I wonder if the Citizens of Hollywood made an appearance to offer authenticity to the theming.